Stocks have surged to all-time highs. And this has plenty of people worried that a crash may be looming. Goldman Sachs’ Jan Hatzius doesn’t see a crash coming. Using a proprietary model that includes the historical price data from 20 advanced economies, Hatzius found that the likelihood of a crash is “average” only. “[O]ur broader view is that the risk of an asset market bust — especially of the recessionary variety — remains relatively low,” Hatzius wrote. However, average is not the danger-zone just yet. In order for their to be a high risk of a crash, according to Goldman Sachs’ model, the curve would have to be high above the straight grey line — aka the zero standard deviation line. On top of that, the general consensus of Goldman research analysts is that the crash is still far off. “Although the current expansion has already lasted longer than the median expansion, we still seem to be quite far from the inflationary overheating or financial imbalance that historically precede most US recessions,” the report states. According to Goldman analysts, the primary factors that determine equity busts are past asset price appreciation, past credit growth, and a rising investment/GDP ratio. 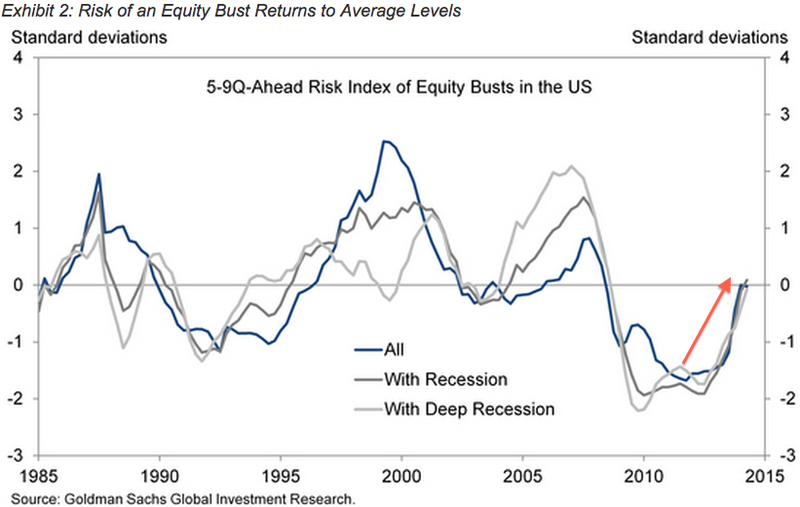 However, when it comes to recessionary equity busts, Goldman looks at credit growth. 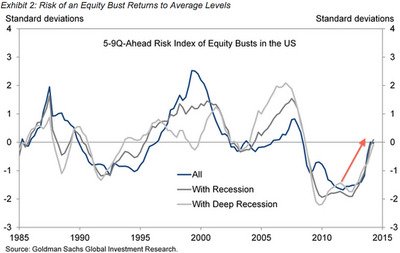 In these cases, while this may seem counterintuitive, recessionary equity busts generally follow low equity volatility. While credit has been expanding and investment spending has been picking up, it’s difficult to argue either are at excessive levels. So while the risk is back to “roughly average” levels, there’s still room for it to get scarier.